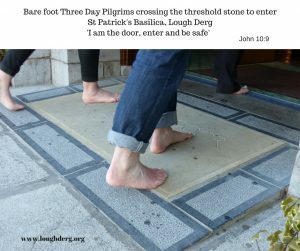 The bare feet that are the tradition on the Lough Derg Pilgrimage are a token of penance. But they also speak of reverence for holy ground. They come to mind as I ponder Mark’s story of the Transfiguration of Jesus for the second Sunday of Lent. Like Moses before the Burning Bush and Elijah at the mouth of the cave on Mount Horeb, those three closest disciples on the mountain of Transfiguration realised they were on holy ground. They did not then realise that they, and we with them, are destined to be transfigured in glory with Christ. In Lent, Jesus invites us too to come apart with him. We dare to hope that we may catch a glimpse of his glory – the Easter glory that he so longs to share with us.